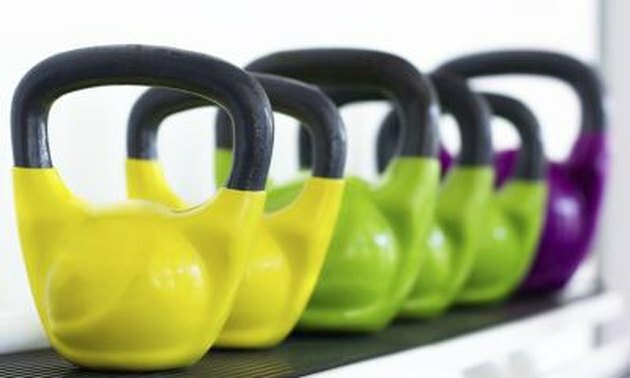 The kettlebell swing is a basic kettlebell exercise that helps you to develop strength, coordination and endurance. The thighs, glutes, back and shoulder are all engaged throughout the movement, which consists of dangling the kettlebell between your legs with your hands and then lifting it up to your chest in an explosive movement. Your thighs – mainly the quadriceps and hamstrings – provide the majority of power during the ascent phase of the swing. Starting with bent knees, your thighs and hips thrust forward as your legs straighten. Together, your abdominal muscles, glutes, pelvis and lower back make up the core, which helps your body with balance, strength and agility. Engaging these muscles during the kettlebell swing helps you to remain stable while moving your body forward and up, and while lifting the kettlebell. The core engagement also helps to protect your lower back during the exercise. The lattisimus dorsi, which are located on each side of your back, and the deltoids, the primary muscles of the shoulder, help you to lift the kettlebell up to your chest. The lats and deltoids also act as stabilizers during the upright movement. What Muscles Are Used in Throwing a Baseball?